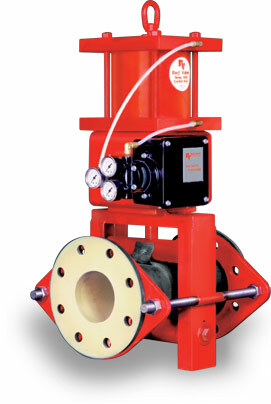 Red Valve Company has developed a new open frame control pinch valve, the Series 5300. The Series 5300 valve features many of the same advantages of the Series 5200 line of control pinch valves, in a light-weight, low-cost open frame design. The open frame design is possible because the sleeve is the only wetted part of the pinch valve, protecting the operating mechanism and frame from corrosive or abrasive attack from the line process. A heavy-duty, rugged pinch mechanism pinches the sleeve, resulting in accurate flow control. The Series 5300 has no packing to maintain or seats to wear, and is well suited for handling corrosives, powders, and slurries. Pneumatic, electric or hydraulic operators are available complete with pneumatic or electro-pneumatic positioners. Due to the fabricated open frame design of the Series 5300, slight variations in face-to-face length can be accommodated.